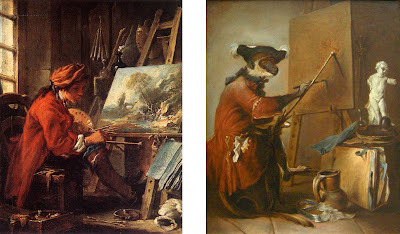 A comparison between yesterday's Chardin Le Singe Peintre (right, 1740) and Francois Boucher's Self-Portrait At Easel (left, 1720, also in The Louvre, Paris). After looking at Chardin's painting monkey, I remembered a portrait of an artist painting that I'd seen recently in a book, a work similar in composition to the Chardin. After a bit of hunting, I found the Boucher self-portrait, painted when he was eighteen years old. Boucher and Chardin were contemporaries but I haven't seen or read any references to a competitive spirit between them, yet it seems there is a striking resemblance between the two paintings so I can't but help thinking that Chardin is perhaps parodying the ostentatiousness of Boucher's Rococo paintings. From what I've seen of Chardin's paintings in the flesh, his work had very little to do with the conventions of Rococo painting from the Baroque period. Perhaps it's Chardin's comment (as a stylistic outsider), on his 'take' of Rococo painting at the time.